I’m always looking for a new snack that isn’t too costly, doen’t take a lot of work to prepare and can easily be substitute for a desired convenience snack. For example my kiddos often want some sort of cracker or chip from the snack food isle at the grocery store. I try to avoid that isle at all costs, but sometimes you just gotta go down it! And to be honest, I want the snacks just as much as they do! Wheat thins have been one of my favorite crackers/chips. They are salty, crispy and taste fantastic with aged sausage and cheese on top! Mmmm. That was a snack my Mom would often serve around the holidays. I am the oldest of five and growing up my Mom didn’t work and finances were tight. Wheat thins or any snack food for that matter was a HUGE treat! I still think they are a treat and CAN’T keep my hands off when we are at a family gathering or holiday party where they are served. So I may not have any self-control there, but I don’t buy them in the grocery store for my family… small victories over my will! This recipe was emailed to me from a friend saying that it seemed like something I might like and I should give it a go. It probably took me a year to “find the time” to make them. You know how it is… you don’t have all the ingredients on hand or forget to get all of the ingredients at the grocery, or attempting a new recipe in your spare time (what little you have) is the last thing you want to do! That being said, I definitely can’t take any credit for this recipe at all. The Paleo Mom came up with this and fine tuned the recipe. I reworded some things for clarity, at least clarity for my brain functioning. However, I didn’t chance the recipe at all and don’t claim any credit for that in the least. The Paleo Mom is “a scientist turned stay-at-home mom who shares recipes, explains the science behind the paleo diet and it’s modifications, and blogs about the challenges of raising a paleo family” as she describes herself. You definitely should check out her blog. There is A LOT of great info contained there! Some of it is way deeper than I ever wanted to know in the science of things, but a great resource to find out more about this particular diet! 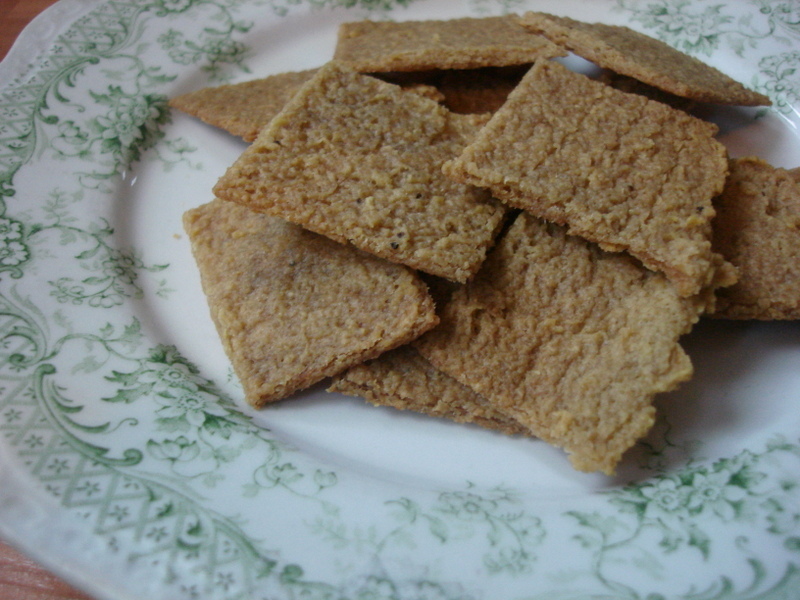 In saying all of that, This recipe reminds me of wheat thins more than anything else. They turn out crispy and salty! Sometimes instead of adding salt to the recipe I just add very coarsely group salt on top. So if you are missing or craving some wheat thins, try this substitute out and see what you think! So here is her fantastic cracker recipe! Check it out! Line a rimmed baking sheet with parchment paper Make sure your parchment goes right up to each edge of the pan. Preheat oven to 300F. Place all ingredients in a [amazon_link id=”B008H4SLV6″ target=”_blank” container=”” container_class=”” ]blender[/amazon_link] or [amazon_link id=”B00004S9EM” target=”_blank” container=”” container_class=”” ]food processor[/amazon_link] and blend until a completely smooth puree is formed, about 2-4 minutes (it doesn’t matter if you don’t have exactly 2 cups of plantain puree as long as you are fairly close, say within ¼ cup). This blends easier if your plantains are at room temperature and your coconut oil is melted. Pour batter (it should look very much like hummus) onto the prepared baking sheet. Use a rubber spatula to smooth it out and cover the entire sheet uniformly (this might take a couple of minutes, but it doesn’t need to be perfect). The batter should be about 1/8” thick. Bake for 10 minutes. Remove from the oven and score the cracker batter with a pastry wheel, pizza cutter, or pastry scraper (which is what I used). You can make whatever size cracker you like. The crackers will pull away from each other slightly while cooking and shrink up a bit, but not much. Place back in the oven and bake for 50-55 minutes, until golden brown (if you have slightly thicker crackers, this may take longer… I’ve occasionally had batches that took 70 minutes before being done). Remove from oven and let cool slightly on the pan. Move to a cooling rack. Once completely cool, you can break apart any crackers that are stuck together. It’s VERY important that the plantains be VERY green. If they are starting to turn yellow they get soft and sweet and don’t ever get crispy when cooked. This is a super important detail that can’t be overlooked! They need to cook until they are starting to turn brown and look dried out. sometimes the center takes longer to cook if it slightly thicker than the edges. If it doesn’t cook all the way, then they won’t be crispy. Also if the plantains are too ripe they won’t get crispy either. Also, VERY important that they cool completely before putting them into an airtight container. If you don’t they will get soft again. I’ve also put them in the dehydrator to get them a little more crispy if I don’t cook them long enough or the plantains are too ripe. It’s worked well for me. So after all that, give it a try and let me know what you think… or stop over for a visit and request a taste!